On 8th September 1864, First Lieutenant Patrick McCarthy of Company C, 182nd New York Infantry (69th New York National Guard), sat down to write a letter to the father of one of his comrades. The young man found himself with the unpleasant task of providing the family with details of their son’s death. Two weeks previously, on 25th August, his fellow company officer and friend Second Lieutenant Daniel Sweeney had died under Confederate fire at the Battle of Ream’s Station, Virginia. Having heard the news, Daniel’s father John had written to McCarthy, seeking further detail as regards his sons final moments. The poignant letter that resulted provides an insight into the sense of loss felt by all those connected with Daniel, and the effect of deaths such as these on those left at home. While working with the National Museum of Ireland I was fortunate to be on hand when letters relating to Lieutenant Sweeney’s death were donated to the institution. Transcribing the letters, it was immediately apparent how poignant they were, as one young man attempted to comfort the father of his friend and comrade, while still struggling to deal with the shock of the loss himself. The National Museum had very little detail regarding either McCarthy or Sweeney, beyond the fact that they served in the 182nd New York (69th New York National Guard) as part of Corcoran’s Irish Legion. The battle in which Daniel lost his life was a major reverse for the Second Corps of the Union Army, which suffered a heavy defeat at the hands of the Confederates. I am in receipt of your letter bearing the date Sept 2nd, and I have haste to comply with your wishes. Poor Dan was killed in action on Thursday August 25th. He was killed nearly outright, he was hit by a cannon shot or a shell unexploded. When poor Dan was killed, our first line of battle gave way and the Rebels were within one hundred yards of us. I was standing by Dan’s side when he got killed. I had my [head] turned looking where a shell exploded amongst our Regiment and when I looked around again I saw Dan and a Captain in our Regiment by the name of Welpley fall. I was thunderstruck by surprise when I saw the two fall. Poor Dan, him and myself were talking not 20 seconds before he was killed. If there was any possibility of bringing Dan’s body off the field, depend on it, I would do it. We had to leave our wounded to a great majority on the field so you can judge how things were. We had only two small Divisions of our Corps engaged; our Division the 2nd and the first Division, and we had opposed to us two entire Corps and two Brigades of Cavalry, and one of their Divisions was larger than our whole force. You might say we fought them 1 to their 8, and we gave them such a bad cutting up that they abandoned their own dead and wounded. I can not say, my Friend Sweeney, who buried Dan’s body, but I know the spot as well as I know where Mulberry Street is, and if there is any possibility of recovering his body it will be attended to. I was speaking to Colonel Murphy, he told me he received a telegram from you and was going to write to you today. We have not much time to ourselves; we do not know if we be in one place 5 minutes we will hear the dreaded order ‘fall in’ given. As a sample, I will give you since this day week we have not had 3 hours sleep on a stretch, but marching and countermarching and building Breastworks. We are in the line awaiting an attack from the enemy. Lee has got reinforced by Early, we are under arms from before break of day awaiting him. By-him Come, he will get a bloody reception, for we are prepared for him. Dan’s watch was taken off his body, and he gave $50 to the Quartermaster Sergeant for to keep for him, which will be delivered to you as soon as possible. His valise is in Warehouse No. 3 lower New York avenue and 19th Street Washington. Edgar M. Carr(?) is the gentleman in charge of his commission and other valuable articles are in it. Write to me and let me know if I will send them on to you. Give my kindest regards to all your family. Poor Dan, the only words he said were ‘give my love to my father and mother and tell them I died doing my duty. Pray may God have mercy on my soul’ 3 times. Friend John Sweeney, any thing that layes in my power I will do it for you about Dan’s body. May God have mercy on his soul, I feel like I’m deserted. I can hardly begin to think about my poor lost Companion. Write to me often. No more at present, but I remain yours in affection. The deaths of Sweeney and Welpley had lasting impacts that were felt by their families for many years after the guns fell silent. 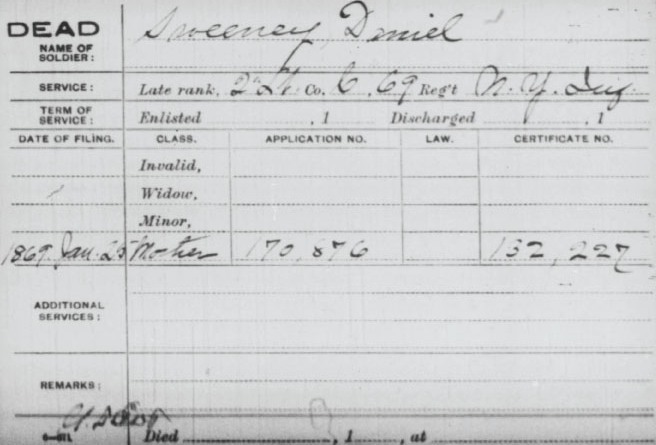 Examination of the 1860 census reveals what may be the 20-year-old Daniel Sweeney living in New York’s First Ward with his father John and mother Ellen. The young man’s occupation was recorded as a mason, while his father worked as a labourer. It would appear that within a few years of Daniel’s death his mother was left without significant financial support- it may be that his father died shortly after the war. In 1869 she sought a pension based on her son’s military service, most probably in an attempt to retain some financial security following the loss of male breadwinners in the household. Unlike Dan, the man who died with him was not a batchelor. In 1857 the then carpenter Francis Welpley had married Ann Donovan. 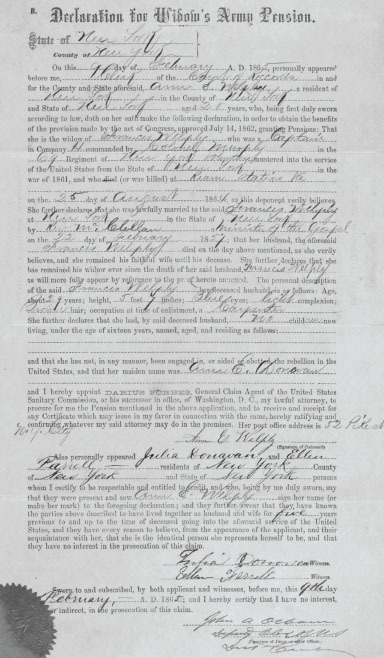 In February 1865 the 28-year-old Ann travelled from her home on 52 Pike Street, New York, to seek a widow’s pension based on her husband’s wartime service. She was accompanied by Julia Donovan and Ellen Farrell, who vouched for her time spent with the Corkman. Her application was successful, and the pension was paid for some 30 years into the 1890s. 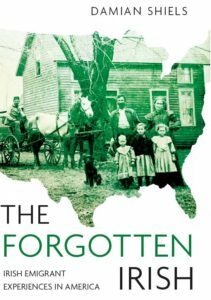 Such details provide glimpses into the far-reaching consequences that the death of a loved one caused for many families in the aftermath of the American Civil War. The single Confederate shell fired on 25th August 1864 at Ream’s Station not only killed two young men, it also changed the lives of the Sweeney and Welpley families forever. 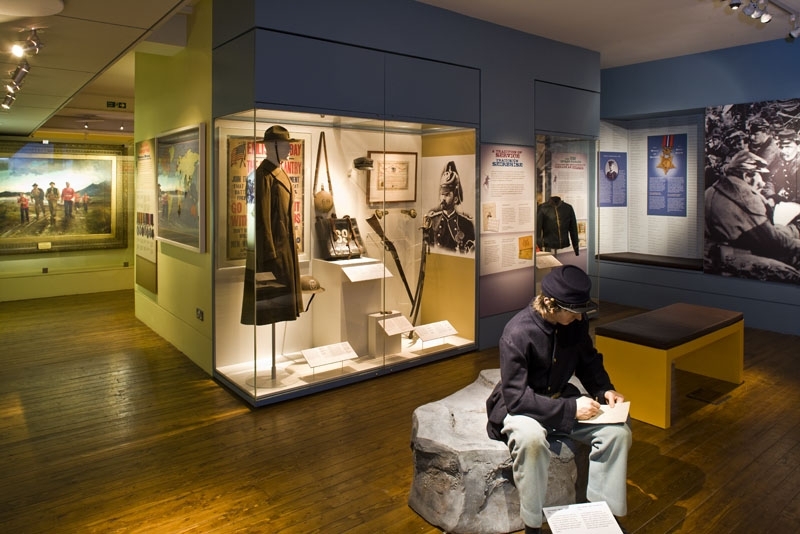 Over 140 years later, the letter written by Patrick McCarthy regarding the incident inspired the creation of a tableau in the National Museum of Ireland’s Soldiers & Chiefs exhibition, where a Federal soldier is shown writing home to his family, in order to highlight the often forgotten connection between events at the front and the future and well-being of those left at home. Frank Welpley was one of the founders of the Phoenix Brigade.In 1860, Welpley was captain of G company, Phoenix Brigade. In 1861 Welpley was captain of the Wolfe Tone Guards.During the ninety day period in 1861, Welpley went to Virginia as an enlisted man in the 69th NYNG.After his death and burial in Virginiia in 1864, Mrs. Welpley returned in 1866, disinterred Captain Welpley’s body, and had him shipped back to County Cork, Ireland. He was very closely associated with Michael Doheny, Michael Corcoran, and Matthew Murphy in NYC.When Terrence Bellow McMannus’ body was shippped back to Ireland in 1861, Welpley was elected as one of three members of the Fenian Brotherhood to accompamy his body. After the funeral, Welpley returned to NYC. I always look forward to any post of the 69th NYNGA… I cannot believe that I had overlooked this. Thanks to you. Regarding Lt. Patrick McCarthy … Do you where he was from? My MCCARTHY are from Mahoonagh, Co Limerick, Ireland. I am going to Ireland next month to find as much MCCARTHY, SHANAHAN, GRIFFIN & TERRY information as I can find. That is something I must check out- I had a feeling he was from Cork but that might be baseless- it is certainly worth exploring. I am from Limerick myself so nice to hear from someone with fellow connections to the county- have you been over before?